“Wash more dishes,” my spiritual director inevitably advises me. This kicks off a prolonged spate of whining on my part. My children are brilliant whiners, and they have taught me well. “But … I’m not good at it!” I insist plaintively, sometimes silently, sometimes out loud. I have always idealized the day that all this housewifery will end and I can “go back to work.” In my fantasies, someone else will clean the house and help the children do homework, while I wear fancy suits (yes, I know no one does this any more — humor me) and stand in the spotlight. After all, didn’t Our Blessed Mother take on a completely new role after the Ascension of Our Lord into heaven? She guided, supported, and advised the new church in Jesus’ absence. The New Testament didn’t exist yet, so who was there to tell the stories of Jesus’ early life? Mary. She could teach the disciples about the message from the Angel Gabriel, who told her that the child to be born to would be called the Son of the Most High, and his kingdom would last forever. Mary could tell of how she lost the child Jesus in Jerusalem and found him again in the temple after three days, the holy temple that Jesus called “my Father’s house.” All the things she had been pondering in her heart, she could tell to the apostles and the disciples as they waited in the upper room for the coming of the Holy Spirit on Pentecost. In a way, she was preaching the Good News to them, teaching them about her son. “But who do you think was doing the dishes? Who was cooking and cleaning for the apostles in the upper room?” a priest asked recently. Dishes?! Again!?! Is the work of a woman really never done? But it isn’t too much of a stretch to think that Mary was taking care of the apostles the same way she always took care of her son Jesus as he grew up in her home. At the wedding of Cana, Mary noticed when the wine ran out, even when it wasn’t her party. She asked Jesus to take care of what was essentially a domestic task, and he did. Mary paid attention to these things. Certainly, Mary could preach, teach, and wash dishes. If anybody could do it all, she could. But there are other women to show us the way as well. St. Gianna Berretta Molla worked as a doctor and a mother while developing an intense interior holiness. Popular Catholic blogger Jennifer Fulwiler took care of five young children while writing posts for the National Catholic Register while being eight or nine months pregnant in the hospital with pulmonary embolisms. My favorite recent post of hers? Because why even have a blog if you can’t write chatty posts while stuck in the hospital? As well-known as Jennifer is, she still says she devotes only 10% of her day to writing and the rest to her home and kids. I’m getting a little nervous. 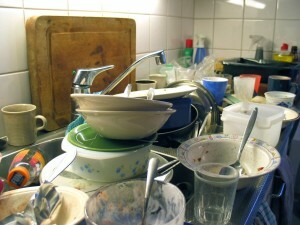 This is the second blogpost I’ve read today about washing dishes. I’m wondering if this is a sign that lots of dishwashing by hand is in my future! But seriously, thanks for a great article. And I totally agree about Jennifer Fulwiler; she and Simcha Fisher are absolutely amazing! There is an apocryphal story about one of the saints, which one I don’t remember, who was a bishop. He was washing dishes one day and had taken off his bishop’s ring. Two men from the Diocese came to inform him that he had just been elevated to Cardinal. But the bishop couldn’t find the ring he had taken off, so they could kiss it. There was a kerfuffle until he finally found the ring. I guess the moral of this story is, if the Lord comes and finds you washing the dishes, you’ll be on the fast track to sainthood. helping you in all things’ (Teresa of Avila). Thanks to Noel, PrairieHawk, and Claire for your wonderful comments. They are much appreciated!